Philips on Tuesday became the first monitor manufacturer to announce a display carrying VESA’s DisplayHDR 1000 certification. The Philips Momentum 43-inch 4K HDR Quantum Dot Monitor (436M6VBPAB) features a diagonal screen size of 42.51 inches and a 4K UHD resolution of 3,840 x 2,160 pixels @ 60Hz (16:9 aspect ratio, 103.64 PPI). It boasts a 4ms gray-to-gray response time, a contrast ratio of 4,000:1 and 178-degree viewing angles. DisplayHDR from VESA is the industry’s first fully open standard specifying HDR quality and stretches across three performance tiers – DisplayHDR 400, DisplayHDR 600 and DisplayHDR 1000 – that correlate to luminance. Philips’ latest offers a peak brightness of 1,000 cd/m² (the typical brightness is rated at 720 nits) and is said to offer a wider range of more accurate colors – especially dark reds and greens – that remain crisp and clear even in bright environments. 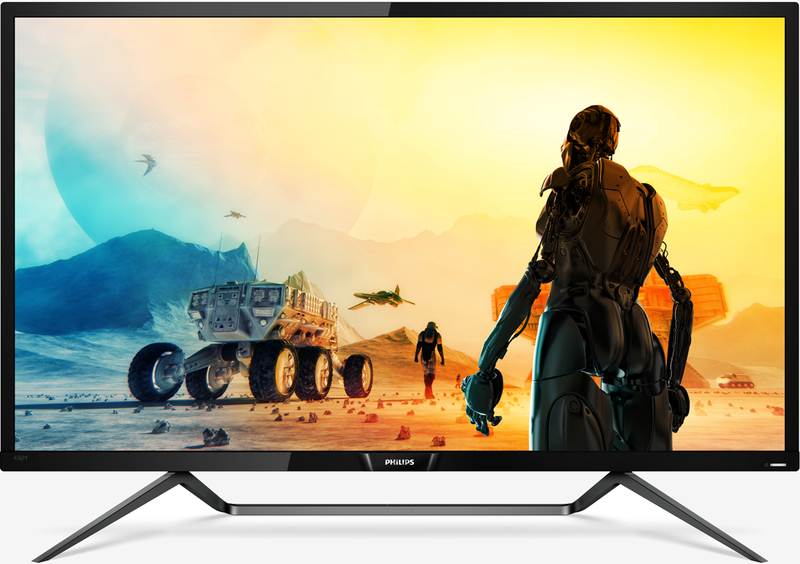 The Philips Momentum 43-inch also utilizes Ambiglow, a background lighting technology that you’ve probably seen offered on televisions in recent years. According to Philips, it uses a “fast internal processor” to analyze incoming image content and adjusts the color and brightness of the background glow accordingly. Connectivity-wise, you’re looking at one HDMI 2.0 port, a DisplayPort 1.2 port and a mini DisplaPort 1.2 port as well as a USB Type-C connection and two USB 3.0 ports. The Philips Momentum 43-inch 4K HDR Quantum Dot Monitor is scheduled to arrive sometime this summer priced at $999.99.